Jori relaxed in the gentle heat of the healing bed. He could feel his pains subside and his body mend. More than that, though, he could feel his brother’s life force. It was still weak, but at least he was still alive. The doctors were no longer in a mad rush, so Jori could only suspect they had done everything they could for now. The rest was up to his brother. Now that the urgency of his brother’s fate had calmed, Jori turned his thoughts on the men lost in the crash, the men who had died to protect Jori and his brother. Jori didn’t care for some of them, Bok especially. Bok was an arrogant brute, quick to temper, and asinine. But many of the others were good men. Veda was one of the best. He was a worthy warrior who fought to defend rather than assault. He was intelligent and used wisdom rather than animalistic brutality to act. Jori was going to miss him the most. Jori realized he was facing the enemy alone. A panic almost rose within him, but he pushed it down. He was a warrior and he would not be afraid. He would fight against these Alliance weaklings if he had to. Jori knew most Alliance personnel were not warriors. And ridiculously, some of them were even women. They were weak and he was strong. But then again, there were far too many of them. He tried not to think about it, but deep down he knew that he was utterly helpless. When the healing bed was done, the lid came open to a smiling nurse above and an Alliance officer standing in the background. A glance at the officer told Jori that he was the commander of this vessel, the same man he had seen on the planet. “How are you feeling?” the nurse asked with genuine kindness. “Well,” Jori responded. As the nurse did a brief inspection, Jori took the opportunity to review his surroundings and make a plan of attack, should it be necessary. His training had taught him to be subtle yet thorough. Two armed security officers stood just outside the divider that sectioned off the area he was in. Jori could sense two more he couldn’t see on either side. And a quick glance further revealed two more guarding the exit. Then there was the commander himself. At least five medical personnel were also nearby. In Tredon, doctors were also warriors. Jori doubted it was so here, but it was best not to make assumptions. The nurse handed him some clothes. They were black and the shirt was long sleeve just like his uniform. But there the similarity ended. The material was not the same, nor was it the same style. At least the clothes are the right color, Jori thought as he accepted the garments. Both the nurse and the commander raised an eyebrow but neither commented. “Very well,” the nurse replied. When the nurse left, the commander approached. Jori stood up off the healing bed and stood in a militaristic at-ease fashion with legs shoulder-width apart and his hands clasped behind his back. He locked eyes with the commander giving him his full attention. “Hello,” the commander said with a kind smile. “I’m J.T.” He held out his hand in greeting. Jori glanced at his hand in confusion. The commander’s smile was genuine, as was the greeting. But this man was his enemy. Be strong but don’t make trouble, Jori reminded himself silently. If the enemy decided to hurt him, they’d have a difficult time of it. But his brother’s life was completely vulnerable. And so he tentatively put out his own hand and performed the customary hand shake of the Alliance. “Jori,” he said, giving his own informal name in return. “And what of my brother? Are you helping him as well?” the boy, Jori, replied in a tone that was almost accusing. J.T. put his hand on Jori’s shoulder to assure him. The boy glanced down at the hand in puzzlement, and for a brief moment J.T. thought he saw the young face soften. The formal demeanor of the boy faltered so quickly that J.T. wondered if he’d really seen it. “You swear it?” Jori demanded. “Yes, I swear it,” J.T. promised. “We must have a full security detail,” Lt. Commander Bracht recommended sternly. “Full security for a single child of no more than ten cycles?” another security officer questioned. J.T. agreed with Bracht to a point. The boy’s phaser was set to kill, but he was defending himself. And he didn’t attack the members of the Alliance. “Killing four men is not just cause?” Bracht challenged almost too angrily. It was his nature to be abrupt so the captain didn’t interpreted his tone as a direct challenge to his authority. “But he didn’t shoot at us,” J.T. objected with a little heat getting into his own voice. J.T. was new to the Odyssey so he didn’t know Bracht well. A part of him was a little afraid of the Rabnoshk warrior, but he wasn’t about to back down. Everything he’d witnessed so far indicated the boy was acting in self-defense. And he’s still just a boy, isn’t he? J.T. wondered. “I have six in sickbay now, Sir,” Bracht replied. “Should I call two of them off?” Bracht’s tone was almost insubordinate… almost. “Yes, Sir,” Bracht replied, somewhat mollified by the captain’s acknowledgement that the boy could be a security risk. “J.T. ?” The captain directed to his commander. J.T. was about to suggest an officer, but realized the captain was asking him to look after the child. “Me?” he asked dubiously. J.T. couldn’t argue with the captain’s logic. Although J.T. wanted to give the boy the benefit of the doubt regarding security, now that he was faced with being directly responsible for him he wondered if he’d taken the wrong stance. Oh, God. What are we getting ourselves into? J.T. wondered for the second time. Even though I’m an artist, I have a difficult time drawing machinery. Hense, the very bad drawing of a crashed ship in my previous post. 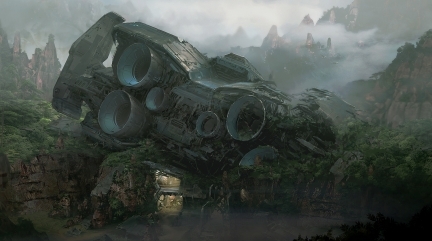 Here is some artwork by someone else of a crashed space ship I found on Bing. Imagine J.T. here as he investigates the wreckage. As Jori beamed off the planet, the scene shifted. He saw the planet and the Alliance ship platform at the same time. Crew members from the Alliance ship began as mere shapes before coming into full view. As he fully coalesced, the medic crew rushed forward with scanners in hand while security crew members stayed back with weapons at the ready. Medical terms were thrown about as the doctors attended the unconscious body of Jori’s brother. She called for someone to bring the other gurney but Jori ignored it. He stepped off the platform to follow the medics with his brother towards sick bay. They tried to get him to stop with words, trying to convince him to get on the gurney. But no one touched him as he walked on, not even security. Jori suspected it would be otherwise should he decide to head in a direction other than sick bay. Since his brother was his main concern, he ignored them. When they reached sick bay, his brother was pulled off to a separate room as more doctors swarmed around. There was a lot of yelling and Jori sensed their urgency. They are serious about helping him, Jori thought with wonder. We are their enemies, yet they are helping us. Perhaps the things he had heard about the Core Alliance were true. Jori’s father would have called their compassion a weakness. At the moment, Jori didn’t care. He was simply grateful for their help. A doctor finally braved touching him. Jori felt the hand on his shoulder and sensed the kindness of the man’s words as he spoke. “We’re going to do everything we can to help him,” the man said. “I promise.” Jori sensed the doctor was sincere and felt comfort at the words. But he didn’t show the doctor any emotion. Emotion was weakness. The doctor finally convinced Jori to lie down, not on a gurney but a healing bed. They asked him his name and tried to get him to talk, but Jori said nothing. They don’t know who I am, he thought. If they knew, things would be different. They must know I am a Tredon but nothing beyond that, thank goodness. The doctor told Jori he had to set his broken arm. When the man moved to give Jori an injection, Jori jerked away. “No,” he said forcefully. “No drugs,” Jori insisted. It was bad enough that he was injured and at their mercy. But to be unconscious or drug-addled would make him completely helpless. The doctor was reluctant to force the issue so he motioned for a medic to help. As the medic held Jori down, the doctor pressed his bone into place. Jori gritted his teeth and grunted, but he neither squirmed nor cried out. The medic and the doctor shared a bemused look but Jori ignored them. He didn’t care about impressing them. His only concern was for his brother. When they were done, the doctor closed the lid of the healing bed. As the vibrations of the bed began to hum, Jori closed his eyes and concentrated on what was going on in the other room with his brother. He felt the tension as the doctors worked. He could tell they were really trying to help. However, it wasn’t them he was trying to sense. It was his brother. Jori focused intently, but his brother’s life force was weak. He was barely alive. Jori swallowed down a sense of dread. What was he going to do if his brother didn’t survive? And what if the doctors found out who his brother was? Would they still help to save his life? Commander J.T. Hapker was still on the planet surface trying to make sense of the wreckage. The captain said the Grapnes told him the Tredons stole their cargo. Yet the Grapnes wouldn’t or couldn’t say what the cargo was supposed to be. There certainly was cargo on this ship, though no longer any good because of the crash and the blaze that followed. But the cargo J.T. had found seemed ordinary. Sure it had value, but not exceedingly so. And the cargo appeared to have all the proper transport marks. Unless the Tredons took time to remark all the cargo, none of them showed marks indicating they belonged to the Grapnes. J.T. found it doubtful the Tredons would go through such trouble of relabeling the cargo. They were blatant about their crimes and weren’t sneaky as were the Grapnes. “We found a total of 12 bodies,” one of the security officers reported. “All dead. All killed in the crash.” J.T. entered the information on his electronic ledger and transmitted it to the captain. “Do it,” J.T. ordered. Something more was going on here and J.T. wanted to know what it was. There is nothing of obvious value on this ship, so what were the Grapnes really after? he wondered. Thank you for reading the Kavakian Empire. This is only the second chapter in a number of chapters to come. Tell me what you think so far. Does the story grab your attention? Do you see any errors or discrepancies? Let me know in comments. Then come back next week where the captain and officers of the Odyssey crew discuss what to do with this dangerous the Tredon child. “Report,” the captain of the Core Alliance vessel directed as he became suddenly vigilant. Almost nothing happened out here on the edge of the Alliance territory. Captain Robert Arden and his crew had been cruising the borders for ten days now with absolutely no activity. It was usually like this, but to not monitor the borders was to invite trouble from their enemies. Today, it looked like trouble was inviting them. On the other side of their border was free space, where peoples from all over the galaxy gathered at the nearby space station for trade. Anyone coming into Alliance space were supposed to go to the Melna check-in post, but every once in a while someone would sneak through. “It’s a Tredon ship, Sir,” the communication officer said with confusion. Robert silently agreed. For the Tredons to send a distress signal when they weren’t even supposed to be here was indeed suspicious. The Tredons were enemies of the Core Alliance. They were a dangerous warrior race and the primary race which his crew was supposed to patrol against. “Something doesn’t sound right,” Hapker said, voicing Robert’s concern out loud. A slight jolt in the ship indicated their vessel’s change of direction and speed. Jensin called out the speed increments and indicated they were headed towards the nearby solar system, Hellana. Robert Arden and his commander monitored. “The Tredon ship is just a small Serpent. The Grapnes ship is actually an Angolan Cougar,” the officer reported. That explains it, the captain thought. The Serpents were small ships intended for quick and silent travel. Since almost all Tredon ships had weapons, the Serpent was basically a fighting cargo ship. It was versatile and quick, a great cargo ship for hit and run pirating, but not for sustained battle. The Cougar, on the other hand, was a full-fledged fighting ship. Generally, the Grapnes used smuggling ships. They weren’t much of a warrior race at all – more like scavengers. They no doubt pilfered this Cougar and made it their own. Despite having a fighting ship, the Grapnes rarely attacked other ships unless they were certain they were going to succeed. The Tredon ship must have been considered vulnerable and valuable enough for the Grapnes to risk such an attack, Robert thought. Still, they are Tredons. What could be so valuable for the Grapnes to risk attacking such a fierce warrior race? The front window of the ship flickered to a new scene. The black and sleek Serpent ship zoomed into view pursued by an older model Cougar. Both ships were firing upon one another. The Cougar was yellowish, like its animal namesake. And despite its older model, it was keeping pace with the Serpent ship. No doubt, this Cougar model had an upgrade. Robert briefly wondered how the Grapnes had managed it. The Serpent raced towards Pensla, a small virtually uninhabited planet. Although this planet supported life, humans could not stay on it long and survive. Sure, they could survive a few weeks. But eventually the air would poison them. Therefore, it was simply a small mining planet. It had some necessary minerals that were mined by specialists, but was not permanently inhabited. “We will be within firing range in less than 20 clicks,” Jensin said when the com channel was closed. As Robert’s ship followed the intruding ships and awaited a response from their captains, he and his crew watched the pursuit continue. “What are they doing?” Commander Hapker asked out loud but more to himself as the Serpent raced directly towards the planet. “It looks like they’re going to try a skimming maneuver,” Jensin offered. “They’d better be damned good pilots to try that,” the commander replied. A skimming maneuver ignited a planet’s upper atmosphere. Doing so would blind the pursuers and the fleeing ship would be able to change direction and hopefully lose their pursuers as they hid on the other side of the planet. The danger was that if not hit just right, the explosion could ignite the very ship setting it. The captain watched in amazement as the explosion filled a large portion of the planet’s upper atmosphere. Did it work, he wondered? “Where’s the Serpent?” the commander demanded. The Cougar fired chaotically in and around the explosion. They couldn’t see the Serpent either. “There it is!” an officer yelled. The screen focused on the Serpent as it flew away from the inferno. Amazingly, it had succeeded in pulling off the skimming maneuver and was making its way around the planet. Suddenly, a stray shot from the Cougar hit the Serpent just before it went out of range. The ship that had just successfully performed an amazing tactic now spiraled out of control. “The Serpent’s going to crash,” Commander Hapker said as the Tredon ship wobbled below into the atmosphere of the planet. “Arm torpedoes!” Chief Security Officer Bracht ordered now that the Odyssey was within firing range. As soon as the torpedoes were armed, the Cougar obeyed the Alliance order to fall back. The main screen changed to the image of a Grapnes. He was a typical Grapnes in appearance. His body was thin and wiry, and in Robert’s opinion, sly-looking. Grapnes were notorious deceivers, although luckily not very smart. “I doubt that,” Commander Hapker muttered. “Yes, Captain Arden,” the Grapnes said meekly. The screen switched back to the full view of the planet scene. The Serpent was nowhere in sight. “The Serpent has crashed,” one of the officers on the bridge reported. “Commander, take a team of medical personnel down to the surface. And two teams of security as well.” They were dealing with a warrior race, after all. And they were likely to be very angry about being shot down. “Yes, Sir,” Commander Hapker replied. “Hurry,” Robert admonished the commander as he was leaving the bridge. Commander J.T. Hapker and his team landed just outside of a firefight. It was four, no three Grapnes as one fell, against one Tredon. And not just any one. It was a child. Hapker would have been stunned to immobility if it hadn’t been for his training. He and his team raced towards the scene, weapons in hand. “Deflectors up and hold fire,” J.T. yelled to his team. In the few moments it took them to reach the scene, all four Grapnes were down. 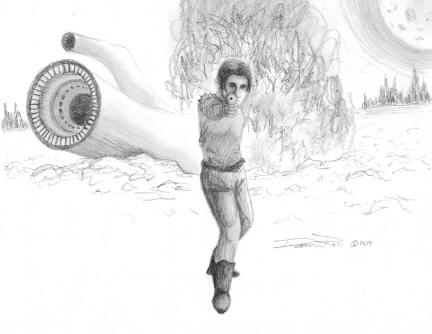 A boy of about ten cycles of age turned to them with his phaser aimed right at them. “Hold fire,” J.T. reminded his team as he came to an abrupt halt. The Tredon child had not fired at them yet. He looked determined enough. His dark eyes glared intently. Despite his youth, he looked every inch a warrior in his black armored uniform; the way he stood defensively and threateningly with the phaser. Yet, he hesitated. If they boy fired, Hapker and his team would be safe because of their body deflectors. But he had a feeling that it would still be a hell of a fight if the boy decided to try it. Hapker slowly let out his breath as the Tredon boy lowered his weapon. The youth had blood on his forehead and his other arm was completely broken, but he didn’t seem to notice. Painfully injured yet still fighting, Hapker thought in awe. Without a word, the boy turned and walked back towards the crashed ship. Hapker motioned his team to follow. The ship was a disaster. Fire, smoldering metal pieces, smoke everywhere. Just inside the gaping door of the ship were bodies. Twisted limbs, blood, pieces of tissue, and the smell of burning flesh. That anyone had survived this crash was amazing. The boy led them in silence straight to one of the bodies. It was greatly broken, but J.T.’s scanner showed he was still alive… barely. “Here!” J.T. yelled to get the attention of one of the doctors. Dr. Jerom came to J.T.’s side and knelt by the body. It was another boy; older, but still young. “We need to get him to the medical bay immediately,” Dr. Jerom said. J.T. put a detector onto the boy and the body of the other youth. “Put down your weapon, son,” J.T. said to the boy, “And we’ll get you both some medical attention.” The boy gave a short nod and set his weapon down. Hapker noticed with alarm that the phaser was a Tredon Star Fire. This weapon doesn’t have a stun setting, just a powerful kill setting. If this boy had fired it at them, J.T. 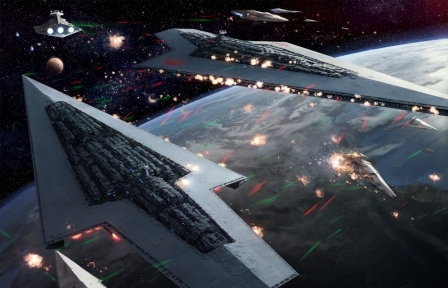 realized, he would have penetrated their body deflectors and killed them too. As the team disintegrated with the boy warriors, J.T. briefly reflected on what had just happened. That boy single-handedly took out four Grapnes and seemingly without emotion. J.T. wasn’t certain, everything happened so fast, but he thought he recalled the boy only firing four shots. Four Grapnes and only four shots. J.T. didn’t think he himself could have hit his marks so quickly and accurately, and under such distress. Was it a mistake to put the boy on his own ship with only three security officers to guard him? What are we getting ourselves into? J.T. wondered. Please leave a comment telling me how you liked the story. Constructive criticism welcome. Does it make you want to read more? Subscribe. This is a space opera. If you’re not familiar with the term space opera, it is basically just a story with a setting in space but with little regard to the technicalities of living and traveling in space. As such, my story is set in a universe where humanoids have populated several planets throughout the galaxy. 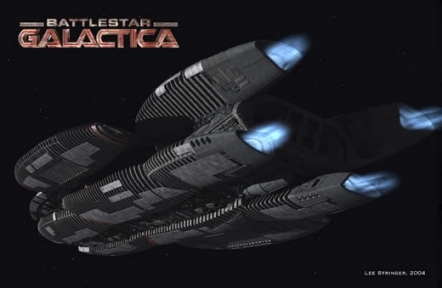 Battlestar Galactica is a space opera. There are some scientific elements, but it is mostly about a story set in space, not about what is or isn’t scientifically plausible. I say humanoids, but they are all humans. They all have similar DNA. Most can intermingle, despite a few thousand years of isolation, while a few others cannot. Most humanoids are comparable in human qualities while others have distinct differences. There are cultural differences as well. Physical differences can be just as diverse as cultural differences, but one thing remains the same – they are all human in nature. How is it possible that all these humanoids with similar DNA have populated the galaxy on numerous worlds, which are all amazingly similar to Earth? Perhaps the Earth man spread out to space generations ago out of necessity. They settled new worlds and lost their Earthian history in the process. It seems scientifically unlikely for so many worlds in the galaxy to have the same gravity pull, atmosphere, rotation, density, orbit, etc. that make human habitation possible. Did their ancestors terraform these planets or was there a divine creator who set them up? The characters in my story may have different beliefs and theories on this, so forget the science of this story. Don’t get caught up on whether such worlds could exist. And don’t analyze the logistics of certain activities such as space travel, transporting, deflector shields, or other things. I’m not a physicist, astronomer, or a space engineer. I’m just a storyteller. 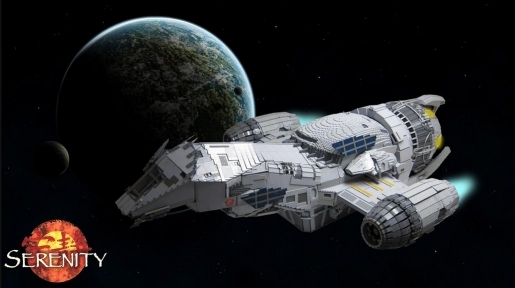 Firefly is another example of a space opera. After all, it would hardly be possible for multiple habitable planets to circle the same sun. The central planets might be habitable but the further planets would be ice cold. 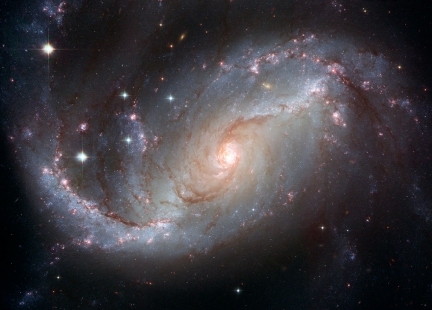 In my make-believe universe, space travel is not only possible, it is relatively easy. It can take years to get from one portion of the galaxy to the other, but core of the inhabitants are merely months or even weeks apart. The centralized part is the Core Alliance. There are other alliances but the Core Alliance is the largest and, of course, central. Although Star Trek might try to imcorporate more plausible scientific elements than other space operas, it is still a space opera. Some of their episodes are way out there. Despite the advances in science, these humanoids suffer from what us humans have always suffered from – human nature – namely greed, malice, violence, hate, ego, etc. Sure, some races of humanoids are more enlightened than others. But they still have their own human flaws. Star Wars got a lot of flack from the scientific community about what was and what wasn’t possible. Who cares? It is a great movie, space opera or not. In our own history, figures have risen far enough above the ability of the average man in order to earn the title of “great”. They overcame adversity, did things that made positive and lasting changes for mankind, or stood above the rest in their righteous morality. It takes a rare individual to do such a thing. Greatness of character is what this story is all about. In this story, or series of stories, I will introduce you to a character and take you through his life up to (and perhaps beyond) his moment of greatness. Keep in mind, there may not always be a single definable plot. This is just a story. Call it rambling if you want. It doesn’t matter because I’m not writing this for the mainstream sci-fi geeks. I’m writing this for me, a sci-fi geek with her own space tale to tell. So stop by again next week for the first chapter in the Kavakian Empire.